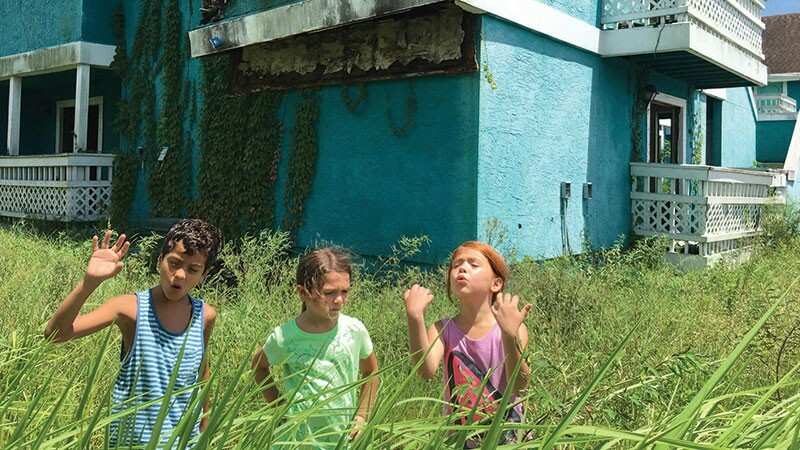 Sean Baker's The Florida Project is bursting with fun, squalor and tragedy. It's shaggy, with what looks like rough-cut editing at times, and it's seemingly been released under its working title. His subject is the adventures of a passel of kids in Kissimmee, not so far from the expensive gates of Disney World, a minimum-wage, subtropical holiday land. Baker positively blasts the screen with color, with Florida sunsets flamboyant enough to dement a parrot. Consultants from Technicolor worked on this, and it shows. Baker's last film, Tangerine, was shot on a cellphone; the visuals here are more than payback for the limits of that kind of photography. The Florida Project repays a big-screen viewing to see the low angle shots of berserk vernacular buildings. Giant oranges, frozen custard stands, a wizard's 30-foot-tall head emerging from a warehouse full of Disney knockoffs—these images revive the feeling of being a kid. Moonee (Brooklynn Prince), age six or so, is a long-term tenant with her mother in the grape-sherbet-colored Magic Castle Motel. It's an adventure exploring the roadside attraction highway lands, or running around with her new pal from downstairs. Everything is exciting: the sightseeing helicopters close enough to buzz the motel, the swamp nearby with the shopping cart sticking out of it, or the fluorescent-colored plastic goodies cramming the aisles in a 99-cent store. The focus is on the kids, as in a crane shot of Moonee and the little terrorists she hangs with running through the balconies. They're Jancey (Valeria Cotto) and the third-grad boy Scooty (Christopher Rivera), a chronic mischief-maker who tries to play it urbane. Those who were raised in a bit of squalor themselves can agree that Baker has perfectly depicted the highs and lows of being a running-wild kid. It's all fun and games until someone calls Social Services. 'The Florida Project' is in limited release.